Having always been taught that age is a sign of quality, the Whisky Virgin is thrilled to realise whiskies aged for less than 10 years are still worth a try – even if you’re observing Dry January. Happy New Year, whisky friends – 2018 is upon us and I’m making the notoriously difficult month of January more unbearable by abstaining from all booze, Scotch included. That means I’ll be writing this here article based on theory and research with absolutely no drinking involved… None at all… probably. Should be easy anyway because during a particularly intense New Year’s Eve banger at my place, bigger boys picked my booze cupboard clean. All that remains is an almost certainly immature and undrinkable bottle of Scotch that my well-meaning auntie got me for Christmas. I can still see her Port-reddened face, smiling down at me as I tackled the wrapping paper that had deffo been saved from the previous year and ironed out for re-use. She’d asked the lady at the whisky shop what one was selling well at the moment, the way aunties do. Barely able to contain her excitement as I unpicked the sticky-tape, she blurted out what it was. But my poor trusting Auntie, brimming with supportiveness for me and my voyage of whisky discovery, had clearly been mugged off by the shop-worker. 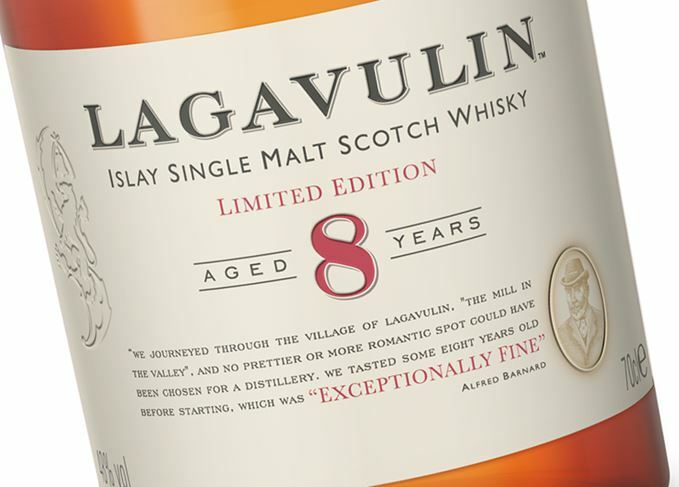 The Lagavulin she was sold was bottled at only eight years old. ‘Do you really?’ she asked, eyes crinkling at the corners with happiness. She doesn’t know what I know. She isn’t aware that to be delicious a whisky has to have spent decades in oak barrels. I’m paraphrasing my hero Bernard Black here, but it’s common knowledge that, when it comes to booze, the older it is, the gooder it is. Basic stuff, right? I tried the classic Lagavulin 16 last year. It tasted like a burnt fish being slapped about with a bag of fruit, but in a way that was totally delicious. By my calculations – did it my head, no big deal – this low-class bottling will be half as good as that. It’s called maths, mate. Knowing that this immature baby Scotch-ling will probs be harsh and overly boozy, I do a quick round of Googling to see how I should safely dispose of it. It has to be useful for cooking or cleaning mirrors or something. But, as I scan the reviews for eight-year-old Lagavulin, I see that the online whisky fam is going crazy for it. It has actually been a best-seller and this originally limited release is going to be rolled out on a permanent basis this year. I gingerly whip the foil off the bottle-top and take a sniff. Sniffing isn’t cheating on Dry January. It can’t smell this good just because I’ve been whisky-deprived for weeks. It’s nutty and salty and smoky, just like its big brother, but that fruitiness and spiciness is super-intense and bright. I’m definitely not going to drink it, though… Absolutely not. A little more research shows me that loads of well-respected names in the Scotch game have bottles out there with less than 10 years on them. You can buy loads of different Caol Ilas at about seven years old and there’s an eight-year-old release from Kilkerran, made at rogue Campbeltown distillery Glengyle, doing the rounds. It also seems that in the ‘90s, seaweedy old Ardbeg dropped a ‘Very Young’ expression that was just a sixer, and now goes for several arms and a big pile of legs at auction. Even before I’d tried my first sip of Scotch, I’d heard tweedy and intimidating drinkists like my granda’ say things like: ‘I’m more into malts at 15 years or more.’ Seems like they might have been missing a big ole trick. I remember the book I bought with my annual Amazon voucher from da’. The Way of Whisky by Dave Broom is all about how our whisky-making cousins in Japan do their thing. Mostly went over my little head, but the pictures were class and it taught me that those guys have a good handle on what happens to whisky as it ages. It has a peak, a moment when it’s at its absolute best, but on the way up it also has fresh qualities that change over time. Young whisky may not be as totally complicated as its older counterparts, but it can have stuff going on that’s worth appreciating. I think of my older, more successful siblings and like the idea that my own immaturity and impulsiveness might not necessarily make me worse than them, just a bit more green and interesting in my own way. Yeah, sounds plausible. In fact, I’ve knocked down whisky that didn’t have an age on the label at all. Some more homework tells me that if you put an age on a bottle of Scotch, then the law says that it has to be the age of the youngest spirit in the bottle. True of blends, true of single malts. It all has to be over three years, but that’s it. Sometimes the whisky makers choose to leave this number off. My mind is blown. My commitment to Dry Jan is in bits. My whisky bottle is open. My glass is full. Oh well, January is dry enough as it is, I can have a taste of Scotch – which I reckon is very different to a drink – and get back on the wagon tomorrow. My baby Scotch is fruity and savoury and light. It’s also super-smoky, but not like cigarettes in nail varnish remover, as I’d naively expected. It’s almost as if the crew at Lagavulin knew what they were doing with this one. It’s not Lagavulin 16, it’s also not really better or worse, it’s just interesting and different. Most of the older peaty Scotch I’ve managed to nab a gulp of has been a little more subdued on the smoke front. I think in future if I’m looking for a total smoke bomb to sip on, I won’t walk straight past more youthful malts. Thanks, Auntie Pat, I’m sorry I ever doubted you. I pop the bottle back into the cupboard to avoid further temptation and write the names of some more bright young bottles onto my whisky hit list for when February rolls around. I’m not saying I won’t always find space for a nice old Scotch with some maturity and woody experience – if I can ever afford one – but then again, there’s plenty of room on the whisky shelf. Will age-stated Japanese whiskies become an endangered species, the Whisky Virgin wonders? The industry shares its hopes for the New Year, from the death of flipping to more NAS whiskies.